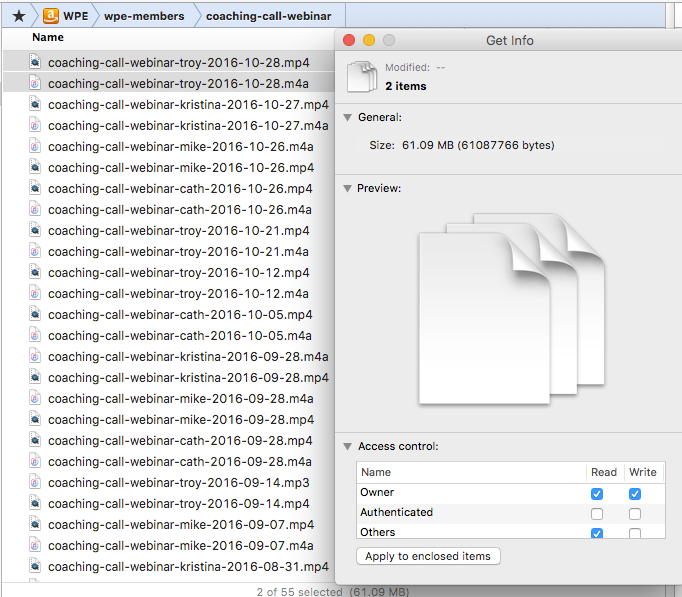 This is the process for uploading coaching calls and webinars to the members website. 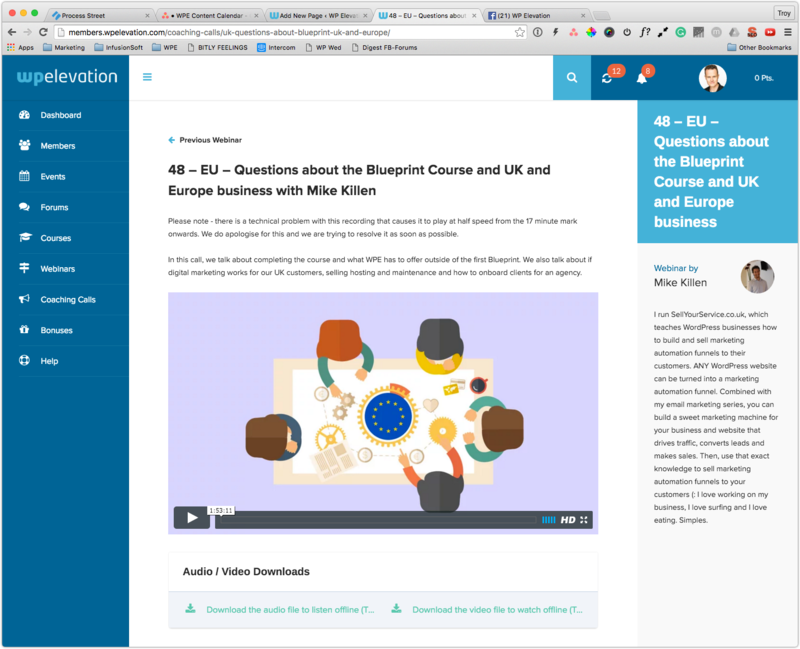 Some of our members are unable to attend webinars or coaching calls live so it is important for us to upload recordings to the members website so that they can revisit them later. Explain what the team member will need in order to complete this process. If you do not have access to these resources, please contact Troy Dean or Gin McInneny and request access. Example of what the task may look like. Zoom auto records the webinars and coaching calls. After a call has finished, it usually takes about an hour for the recording to appear. You will be notified through the slack automation channel when it is ready. You can not start this task till then. The first part of this process is to make sure you have all the assets required for uploading the call to the website. 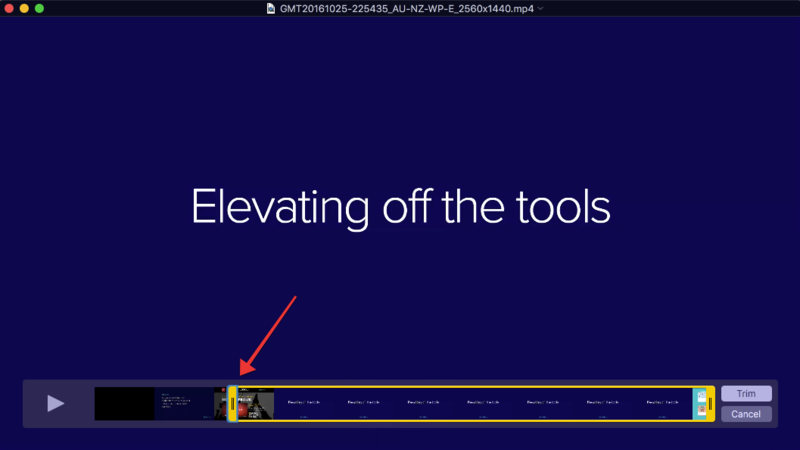 In this step we will take the recordings from the Zoom Webinar and put them into Google Drive. Sign into Zoom. You will either use the Coaches login or Troy's login. Download both of the files (Video and Audio) to your desktop. While your files are downloading, you need to create a folder inside the Google Drive. 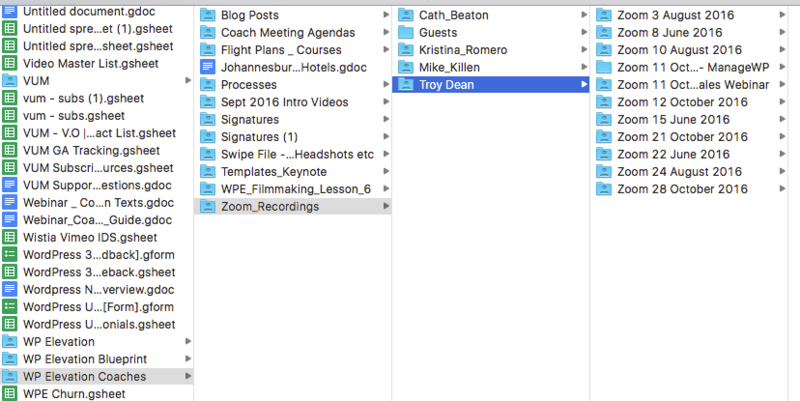 Create a new folder in the coaches folder called "Zoom (Day Month Year)". Note: We now edit the videos and audio to start when the content start, we remove the introductions and welcomes. This is usually about 10 minutes in. Pay close attention to the slides, and you will able to see when the coach first start their presentation. Find the part when the content of the presentation actually starts. Pause the video right before the coach begins to speak. Make a note of the time. From the top toolbar, hit Edit -> Trim at the time you just noted. The presentation starts here. We will trim out the video before then. Label the video: "coaching-call-webinar-coach-year-month-day" for example: "coaching-call-webinar-troy-2016-06-08"
IMPORTANT: Repeat these steps with the audio file. You will need to make sure that both have been successfully uploaded to Google Drive before continuing to the next step. You now need to wait for them to upload in Google Drive. We user Vimeo to host all our videos. It usually takes about 1 hour for Vimeo to convert the video. When the conversion is successful, you will be notified in the Automation channel in Slack. Log into our Vimeo account using the logins in the vault. 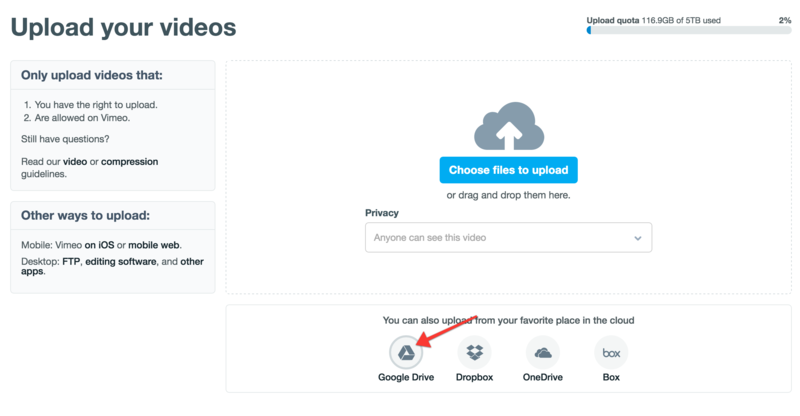 Choose Google Drive from the upload options. 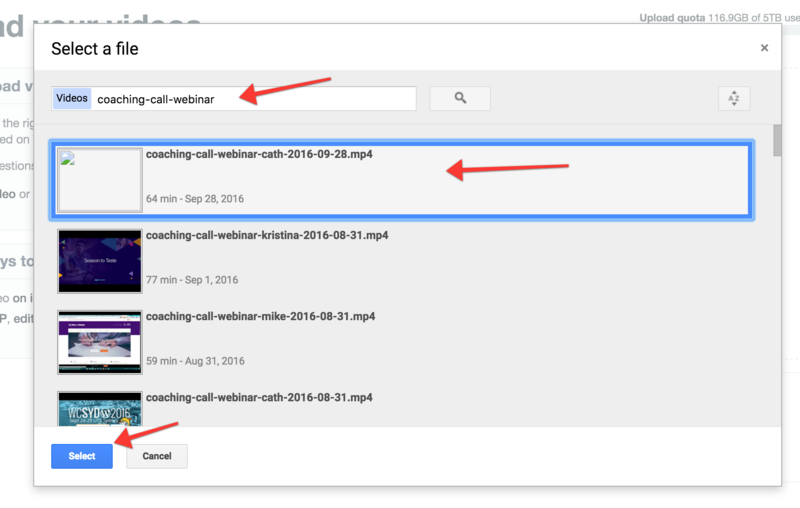 Type in coaching-call-webinar on the videos search box. Select the correct file for the call you are working on, normally its the first file on the list. But it is worth checking the date on the file names too. Once you have chosen the correct file, click "Select" button to start the upload. 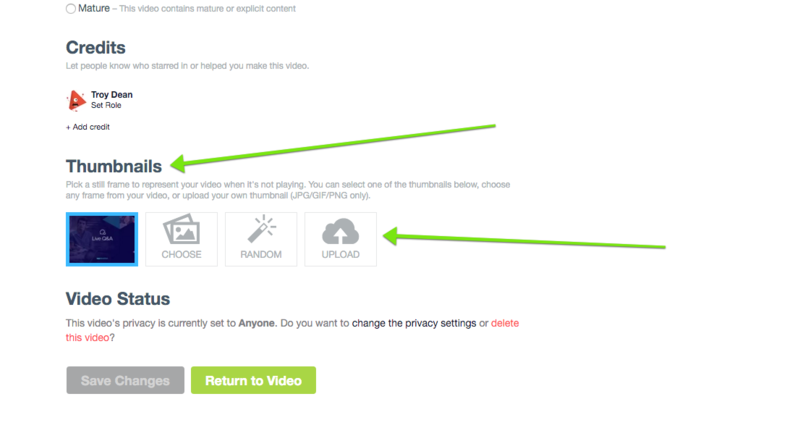 Once the video has uploaded, click the Edit Settings button. 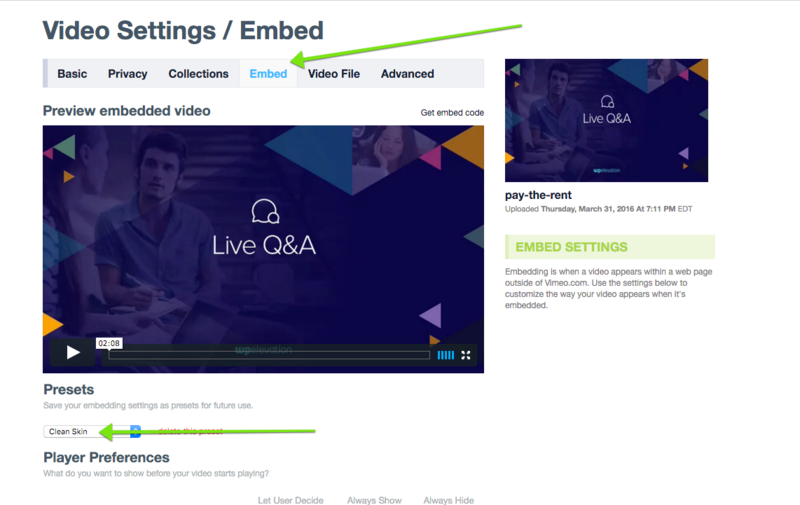 Scroll down to change the thumbnail of the video and upload the thumbnail that should already be in the DropBox > WPE VUM Blog Images > 04 Video Thumbnails folder. Under the Embed settings choose Clean Skin. 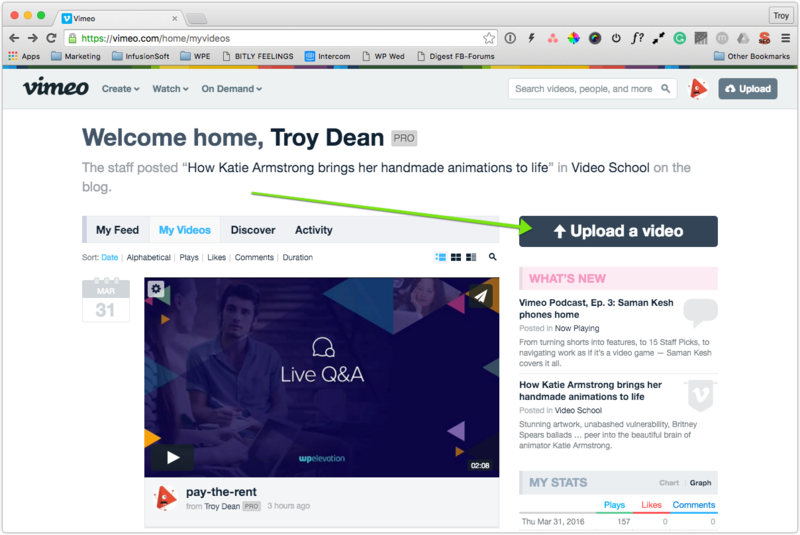 This will remove any Vimeo branding and provide a nice clean video player for our viewers. 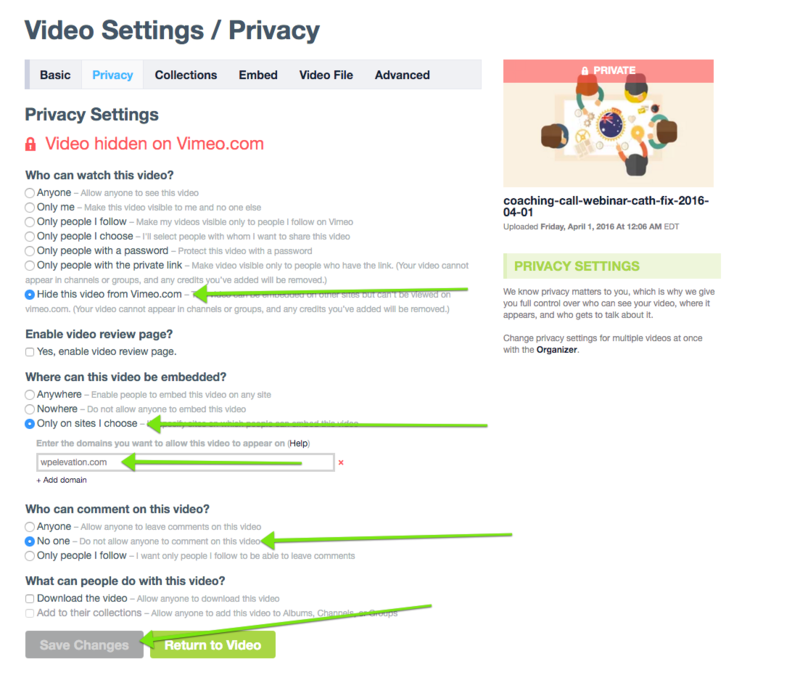 Under the Privacy tab, choose the settings as shown in the screenshot below This will mean that the video will show in the members website but will not be able to be played on any other websites. Some of our members prefer to watch our calls off-line on their smart phone or iPad while they are traveling so it is important for us to provide video and audio files they can download. We use MultiCloud to quick transfer files through the cloud, instead of having to wait for them to upload. Then navigate to the folder you just created. Right click on both the mp4 and the m4a file and click "copy"
In MultiCloud go to WPE amazon S3 account. Navigate to wpe-members > coaching-call-webinars. Wait for the files to upload. There is a progress bar in the bottom right-hand corner. Wait for them to upload. You now need to change the permissions of the file so they will be accessible to the member. Using your program of choice (Forklift or S3 Hub), navigate to the files you just uploaded. Select them both, and right click and Get Info. When the dialogue box opens, check the Others / Read option. Then click Apply to enclosed items. Then right click and select Copy URL to Clipboard. In some cases a coach will supply a PDF or a Keynote of a presentation which they want to share with the members. If this is the case you need to download the file from the asana task to your desktop, then upload it to S3, so we can include it on the page. 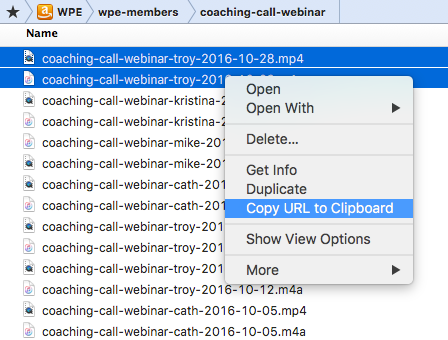 Because the file size will be small, you can upload the resource file directly to the coaching-call-webinar folder in S3 using either Forklift or S3 Hub. Be sure to change the permissions and make a note of the URL(s) in Asana. The next few steps will help you create the actual page in the members website, protect it so that it is only available for members and publish it. 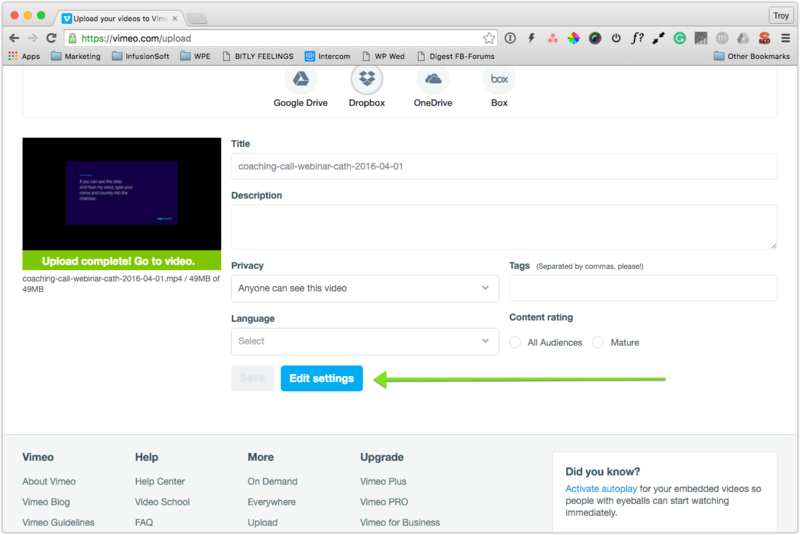 You should only begin this task once the Vimeo Video has been converted properly, otherwise members will not be able to access the video. 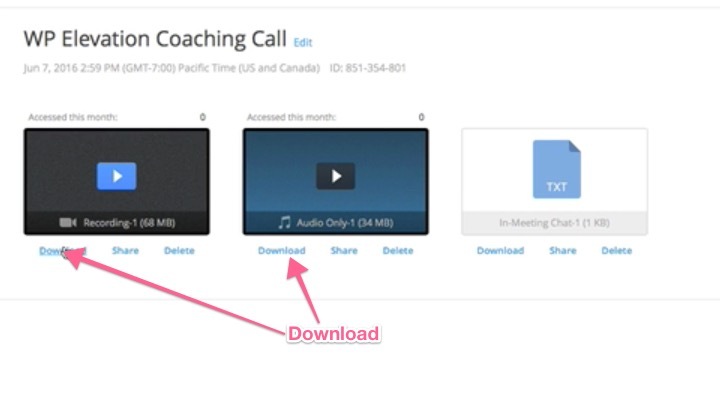 Please be aware before you being if you are uploading a coaching call or a webinar. It will be clearly stated in the asana task. Logins to the website will be in the vault. 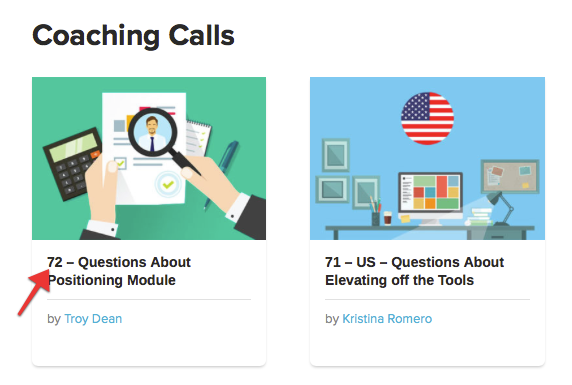 Go to either the coaching calls or the webinars page and make a note of what the number of the last call. In the screenshot below, the last coaching call was 72, so this coaching call will be 73. The following describes how you should enter each of the elements. Below this is a checklist where you can confirm you have completed all the parts. If you unsure what part of the checklist means, please refer to the explinations below. Add a Page Title in this format: "Number - Asana Title"
Example: "73 - Project Management Basics"
Add a Page Title in this format: "Number - Questions About Asana Title"
General Example: "73 - Questions About Content Equals Customers"
Module Example: "73 - Questions About Positioning Module"
Add a Page Title in this format: "Number - Country - Questions About Asana Title"
US Example: "71 – US – Questions About Elevating off the Tools"
UK/EU Example: "71 – UK/EU – Questions About Elevating off the Tools"
AU Example: "71 – AU – Questions About Elevating off the Tools"
Choose Webinar as the page template even if it is a coaching call. You will notice the layout changes to reflect the information we need to post up. Set the "Order" to be the same as the number in the title plus a zero. Change 'Parent' to be either Coaching Call or Webinar. 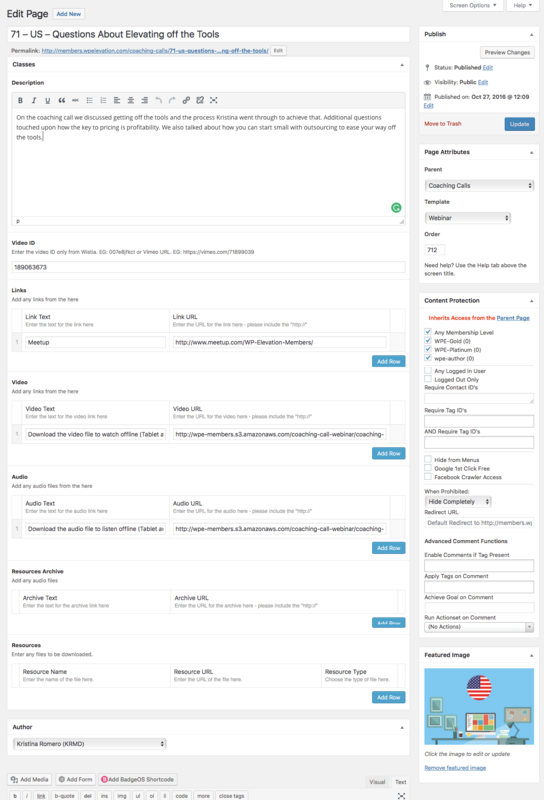 Add the description of the call that the coach has provided you in asana (website overview). Add the ID of the video from Vimeo. The ID is just the last series of numbers at the end of the URL. Choose the correct author of the call depending who hosted the call. This will be the person who the task is assigned to in asana. Add any links under Resource Links in asana. The format for adding a link is to add the text first and then the URL. The URLs for the S3 Download Video are in the asana task. Add them to the Video section. The URLs for the S3 Download Audio are in the asana task. Add them to the Audio section. 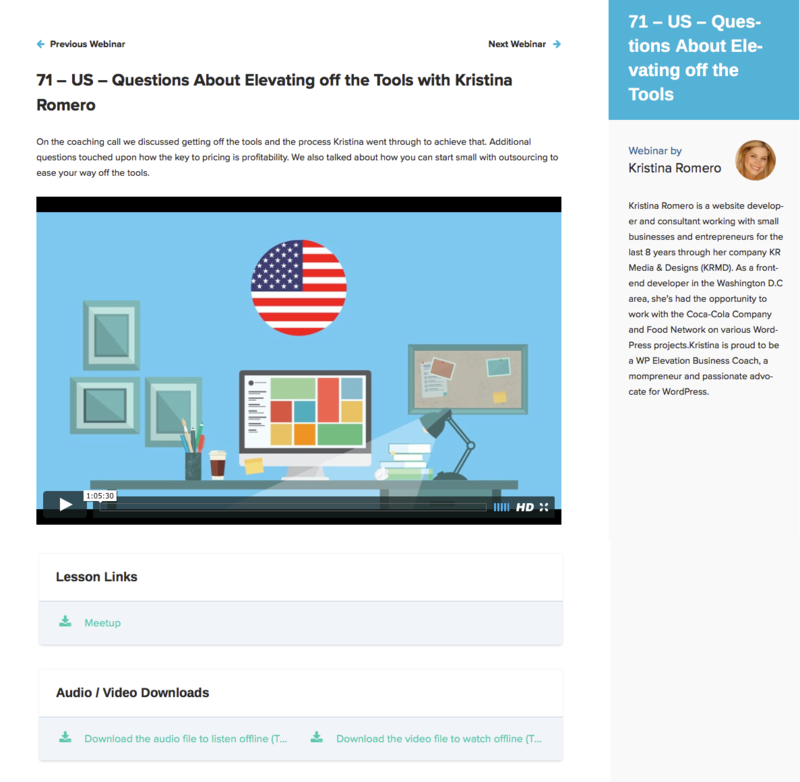 If there were any lesson resources add them to the Resources section. Make this content available to members only by placing a tick in the Any Membership Level tick box. When you are happy with the page, publish it. Then immediately check all links. Protect the content (make sure all three options are ticked. Your web page will now be published. You now need to check everything on the page. Congratulations, you have uploaded a page. Get your manager to sign off that the page is correct. After you have uploaded the call / webinar to the website. You need to log back into zoom, and delete the recording. The reason for this is that there is a 1gb limit to the recordings in zoom. You will know this process is complete when you have a coaching call page on the members website with a video that plays and links that work. See the screenshot below for example.